Some recipes that instruct you to boil spareribs before finishing them on the grill or baking in the oven. Parboiling is done by bringing a pot of water just up to boiling. Then the ribs are immersed in the water for three to four minutes. There are pros and cons to boiling spareribs. While it is a matter of personal taste, it is good to understand why boiling is used, how it will affect your spareribs, and what alternatives you can use. 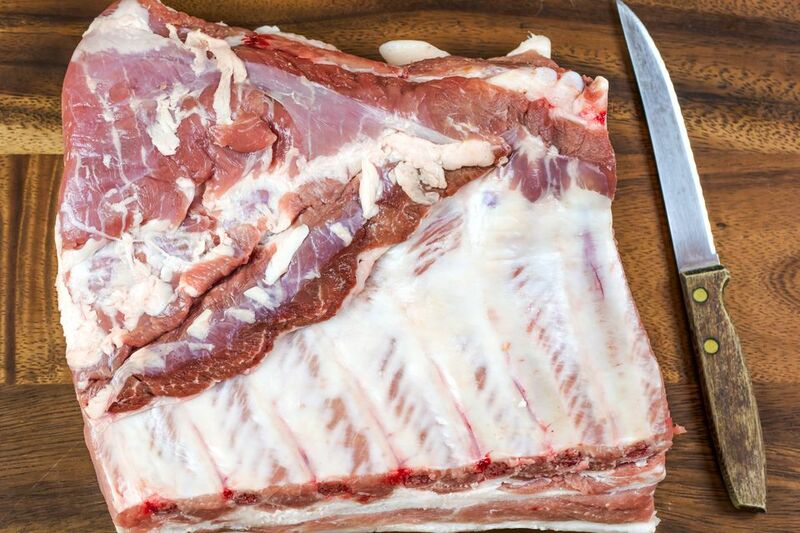 Since the ribs are fatty, many cooks choose to parboil spareribs for a short time or boil for an extended period of time to tenderize the rib meat. This renders some of the surface fat and makes it easier to remove the inner skin from the ribs before you grill them, too. This step is also used to shorten the cooking time. The ribs are then further cooked on the grill or in the oven, usually with a sauce. Some recipes simmer the ribs longer, such as for an hour. This will greatly reduce the cooking time on the grill, and the long simmer will soften the connective tissue of the meat, resulting in much more tender ribs. It is important that you simmer the ribs rather than cook them at a full boil for a long time. The heat of a boil can result in tough meat. Boiling the meat not only renders out the fat but it also naturally releases the natural juices of the spareribs, both of which are important to maintain the true flavor of the ribs. Parboiling doesn't remove much of the natural flavor, but there will still be some loss. Simmering for an hour will result in a large loss of flavor, which can be tasted in the water. The water itself may be used as a broth for rice or other dishes. Although spareribs are often served glazed or with a sauce, the meat itself can be dry after it loses its natural juices due to boiling. Marinades: These are also recommended to add flavor and tenderize ribs. Steaming: If you have a large enough steamer or can improvise one, steam the ribs over water or apple juice for an hour. Slow oven baking: This is a braising method. Prepare a pan of water or apple juice and place the ribs on a rack above them. You can improvise a rack with a row of celery or aluminum foil bunched up into balls in the bottom of the pan. Ensure that the ribs don't touch the liquid. Start the ribs at 350 F and decrease the temperature to 225 F after 15 minutes, baking for about an hour. Slow smoking: Long and slow cooking in a smoker will keep the ribs flavorful.